Dr. William Coleman Harrison, 79, of 1809 South Tenth died Friday evening at a local hospital. Funeral arrangements are pending at Wilkerson and Hatch Funeral Home. 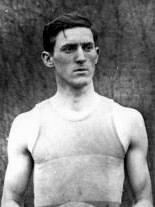 Dr. Harrison was born in Kentucky on May 3, 1890. He was graduated from Kentucky State University and attended Southern Baptist Theological Seminary, Louisville, Ky., where he earned his doctorate of philosophy. He was sent to Brazil in 1925 by an appointment of the Foreign Mission Board of the Southern Baptist Convention. While in Brazil he taught the Old Testament and Greek in two seminaries. He was married in 1939 and traveled south to work in extreme southern Brazil in the state of Rio Grande. He was coordinator of the college at Porto Alegre, which was founded by his wife's sister and husband. After retiring, he returned to Waco and taught as a visiting professor at Baylor University and Paul Quinn College. He is survived by his wife, Mrs. Helen Bagby Harrison, of 1809 South Tenth; a son, Capt. 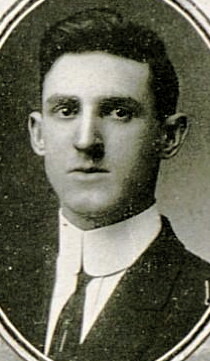 William B. Harrison, Panama Canal Zone; a daughter, Mrs. Alice Ann Wise of Grand Junction, Colo.; a brother, Miller B. Harrison of Kentucky; and three grandchildren. The ordinary pigskin, which is a slang term for football, is not, in the general sense of the term, widely traveled. 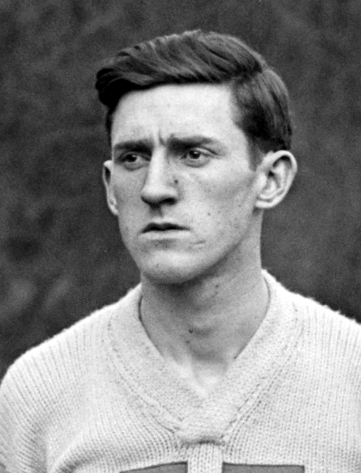 It may cover considerable yardage in the course of an afternoon, being kicked, thrown and carried up and down a gridiron, to say nothing of side excursions made through zany bounding over the sidelines, but it is unlikely, even if it escapes damage and theft (by some over-enthusiastic fan), to run up any appreciable mileage. This, however, is the tale of a football that's been places, to another continent on the other side of the equator, and that at last has come to Lexington for safe and quiet repose in the University of Kentucky's athletic trophy case - wherever it is. This piece of stitched and laced leather, no longer as pliable as it once was, has full reason to present the worn and weary appearance that it does. It is 27 years old, and it definitely has a past. 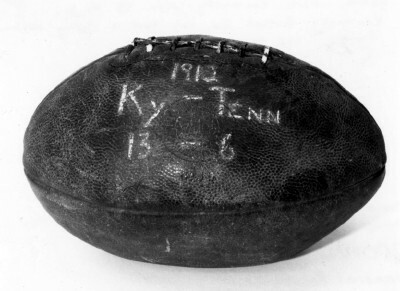 This was ball was used in the Kentucky-Tennessee game on Thanksgiving Day back in 1912, and it was the one with which W.C. Harrison, a Wildcat gridiron great of another day, registered the only touchdown he ever scored. 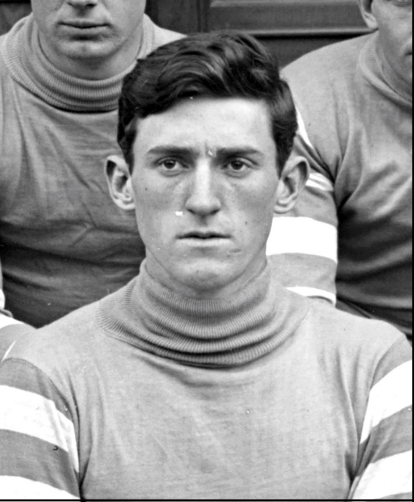 From that day until recently, when he sent the ball back from South America to his alma mater, it had remained in the possession of the rawboned, six foot four inch "Shorty" Harrison, captain of the Kentucky team of 1912 and called by many old-timers one of the greatest tackles in the history of Wildcat football. The story behind the ball was related the other day by Dr. J.S. (Brick) Chambers, now head of the University dispensary, a teammate of the illustrious Harrison in their undergraduate days. A Touchdown Plan, and it Worked! 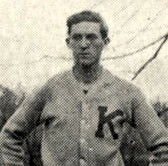 The popular Harrison, who in his senior year also was captain of the Kentucky basketball team, had played three seasons of football as a Wildcat and was near the end of his career as a gridder when the team traveled to Knoxville in 1912 for its annual battle with Tennessee. Coach E.R. 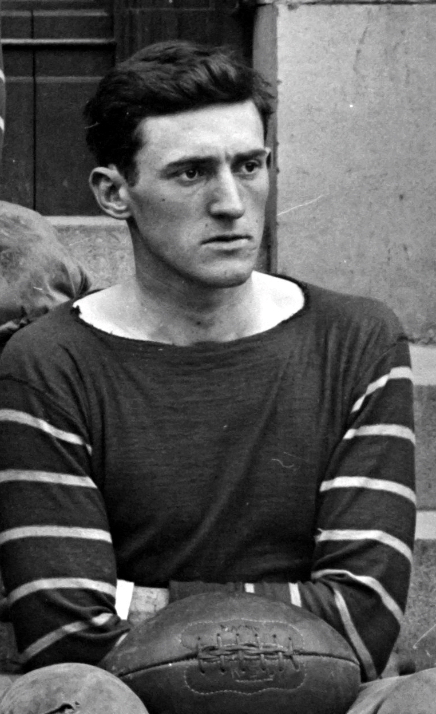 Sweetland was sick at the time, so the team was in charge of one of his assistants, John J. Tigert, now president of the University of Florida. 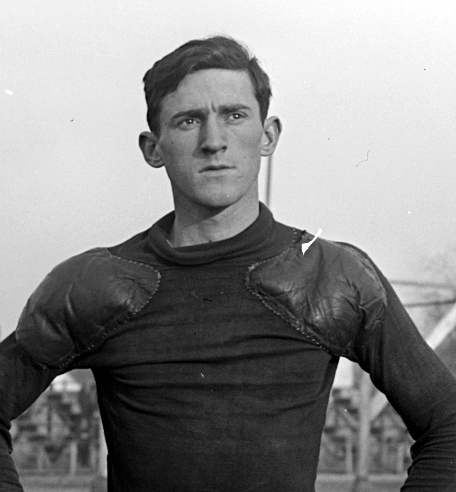 During the train ride to Knoxville, Harrison complained to the other Wildcats that in all the time he had played football he had never made a touchdown. Whereupon several teammates, in a kidding way, decided that when the team took the field the next day against the Vols that situation would be remedied. In mock seriousness they made their plans, deciding that the best way for Harrison, the left tackle, to make a touchdown would be to block a kick. 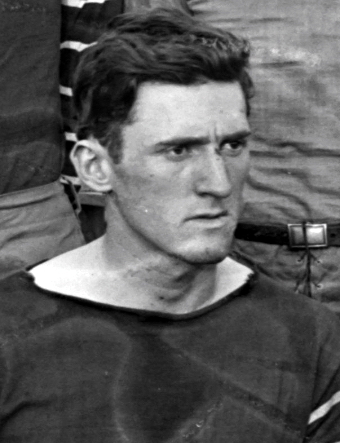 Leaders in the plotting were Brick Chambers, center of the team, and "Red Doc" Rodes, who played defensive end alongside Harrison. Their plan was that Harrison should open a hole in the Tennessee line. Chambers from his position backing up the line, should go through and get the Vol back protecting the kicker, and Rodes should cut through and block the punt, with Harrison then to pick up the ball and scoot for a touchdown. On the appointed, eventful day, the Vols after receiving the opening kickoff failed to gain and lined up in punt formation on their own 20-yard line. The "conspirators," still enjoying their own little joke, quickly whispered to each other: "Now's the time, now's the time. We'll do it now." Sure enough, and it would have been one for Ripley if he had been collecting oddities in those days, the "plan" went off like clockwork. Chambers took out the protecting back, Rodes thrust his chest in the way of the punted ball, and Harrison grabbed up the bounding leather and galloped some 20 yards for the first Kentucky touchdown as the Wildcats humbled the Vols that day by 13-6. After the game, the ball, of course, was given to Harrison, to become one of his most cherished possessions. 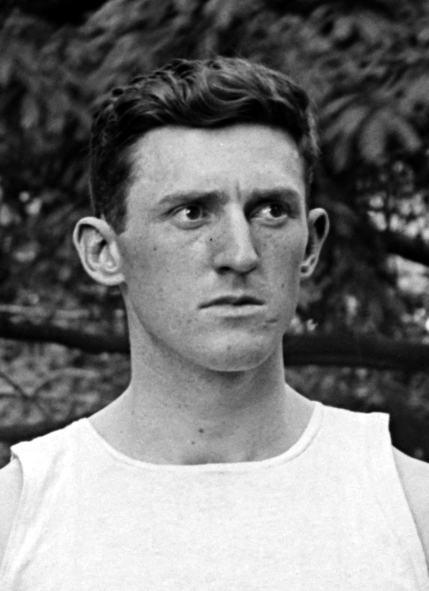 After finishing his brilliant career as a Wildcat athlete and completing his work at the University, he returned to his home near Bagdad, Shelby County: bought a farm adjoining his father's, married and settled down there. He was successful as a farmer and also prospered with his father in a roller mill they bought near their home, but after the death of his wife and three of their four children he lost interest in his work and suddenly, several years later, decided to enter the ministry. He entered the Louisville Baptist Seminary, and after completing his study there went to South America. He has resided there ever since, teaching Latin and Greek in a Spanish Baptist College in Rio de Janeiro and pursing as a hobby his study of archaeology in the Holy Land, a subject in which he has become intensely interested. On his last visit to this country about four years ago he came back to Lexington and renewed acquaintances on the University campus. A few weeks ago, in response to circular letters Prof. Ezra Gillis is sending out to former U.K. students in his research project, Mr. Harrison sent his prized football back to his alma mater. Professor Gillis turned it over to Dr. Chambers, one of Mr. Harrison's "touchdown partners," and the latter plans to have it mounted and appropriately painted before placing it with the other Kentucky athletic trophies.